Thank you so much for the fair and balanced review of our history! I’m glad someone actually took the time and read up on our history in a non biased manner! One small correction, the martyrs will be commemorated on the 15th and not the 14th of February. Thanks again. Mr. Resk – thank you for painting your beautiful icon! Thanks for the correction on the date; I’ll fix it. Please keep in touch, and pray for me! Are prints of the icon available for purchase? Where? I don’t know — I hope so! Tony, do you know anything about this? Hi there – I just wondered in from google. This is a great article and a great introduction! 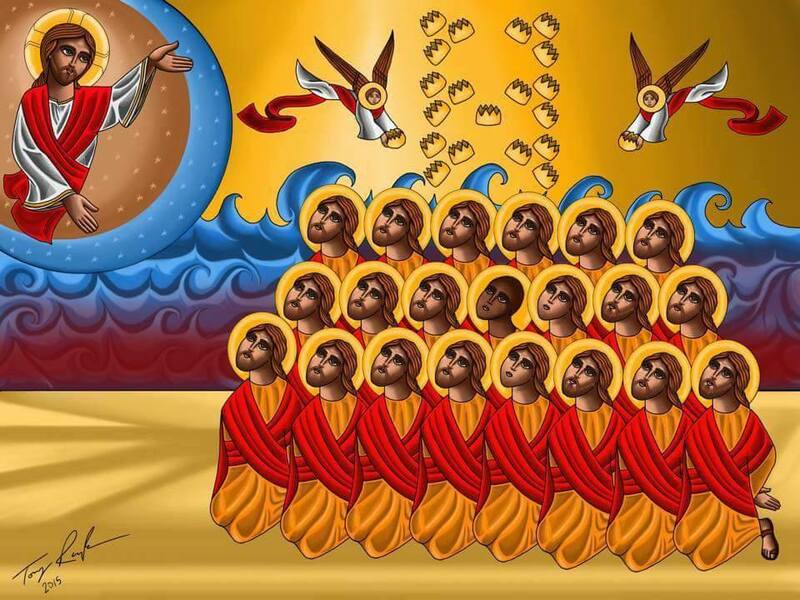 I do have one minor correction, however: The Copts are **a** (not “the”) modern Christian group that count themselves as the present-day successors of the historic Church in Alexandria. There are, in fact, two such groups. The Copts are by far the largest, of course, but there is also a Chalcedonian (i.e. “Greek”) Orthodox Patriarch of Alexandria. The two Patriarchates of Alexandria – Coptic and Greek Orthodox – are currently enjoying very good relations, and they recognize each other’s baptisms and marriages, although they are not formally in communion. Hi there! Yes, fair enough. I’m aware of the Greek Orthodox Patriarchate of Alexandria, of course; I suppose from their perspective the non-Chalcedonian patriarchate represents the “winning side” for Alexandria about as much as the Greek Orthodox represent the “winning side” at the Council of Chalcedon. Thank you!